Having the right equipment and work environment will reduce injury and improve performance. This is true for athletes as well as for people using computers, laptops, tablets and smartphones. We look down and curve our upper spine to read the tablet, crane our heads forward to read the screen, lift our shoulders, arms and hands up to the laptop keyboard to enter data, and we bend our heads down and squint to read the smartphone—all occurring without awareness (Straker et al, 2008; Asunda, Odell, Luce, & Dennerlein, 2010; Peper et al, 2014). We are captured by the devices and stay immobilized until we hurt. At the end of the work day, we are often exhausted and experience neck and shoulder stiffness, arm pain and eye fatigue. This stress immobility syndrome is the twenty first century reward for digital immigrants and natives. We hurt because we fit ourselves to the environment instead of changing the environment to fit us. 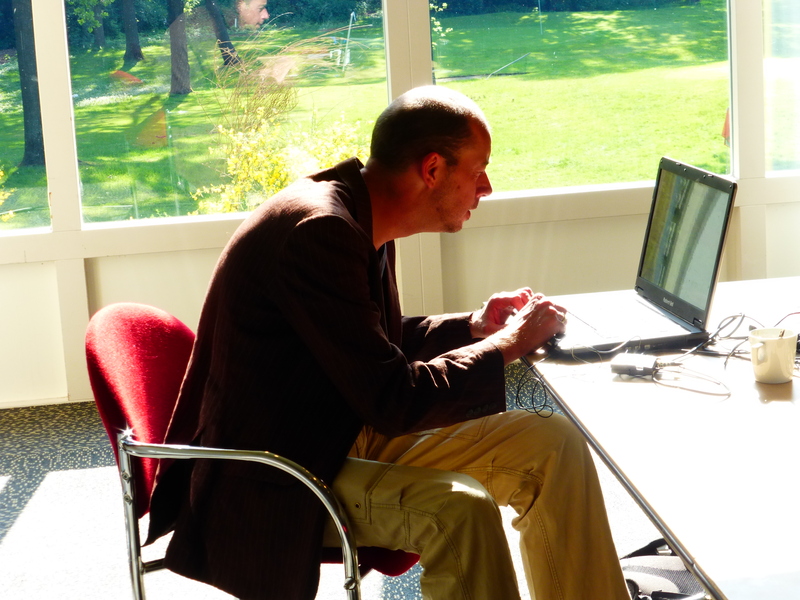 The predominant slouched position even affects our mood and strength (Peper and Lin, 2012). Experience how your strength decreases when you slouch and look downward as compared when you sit tall with your spine lengthened at your laptop, tablet or phone. You will need a partner to do this practice as shown in Figure 1. Sit in your slouched position while looking down and extend your arm to the side. Have your partner stand behind you and gently press downward on your upper arm near your wrist while you attempt to resist the pressure. Now relax and let your arms hang along the side of your body. Now sit upright in a tall position with your spine lengthening while looking straight ahead. Again extend your arm and gently have your gently press downward on your upper arm near your wrist while you attempt to resist the pressure. Figure 1. Measuring the ability to resist the downward pressure on the forearm while sitting in either slouched or tall position. 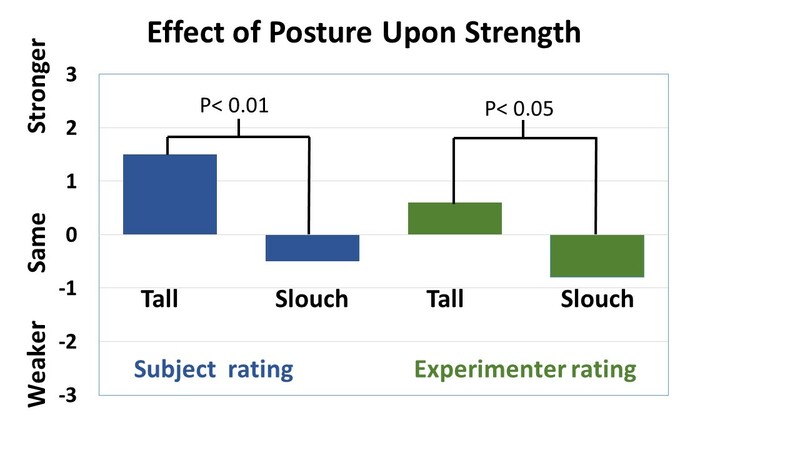 You probably experienced significantly more strength resisting the downward pressure when sitting erect and tall than when sitting collapsed as we discovered in our study at San Francisco State University in with students as shown in figure 2. Figure 2. Change in perceived strength resisting a downward pressure on the extended arm while sitting. Reproduced by permission from Schwanbeck, R., Peper, E., Booiman, A., Harvey, R., and Lin, I-M. (in press). Become the unreasonable person and fit the world so that you are comfortable while using digital devices. There are solutions! Take responsibility and adjust your posture to a healthy one–it will make your life so much more energetic. Sit on your sit bones (ischial tuberosities) as if they are the feet of your pelvis and feel your spine lengthening as you sit tall. Alternatively, stand while working and adjust the desk height for your size. Regardless of whether you sit or stand while working, take many breaks to interrupt your immobilized posture. Install a software program on computer to remind you to take breaks and watch the YouTube clips on cartoon ergonomics for working at the computer. 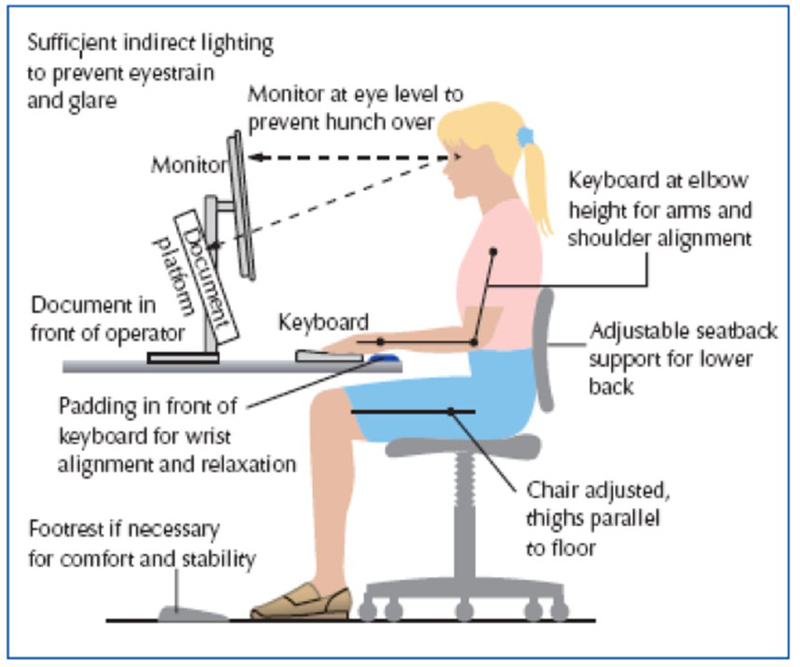 For working at a computer sit in a chair with your feet on the floor, the elbows bend at 90 degrees with the hands, wrists, and forearms are straight, in-line and roughly parallel to the floor so that the hands can be on the keyboard while the top of monitor is at eye brow level as shown in Figure 3. For working with a laptop you will always compromise body position. If the screen is at eye level, you have to bring your arms and hands up to the keyboard, or, more commonly, you will look down at the screen while at the same time raising your hands to reach the keyboard. 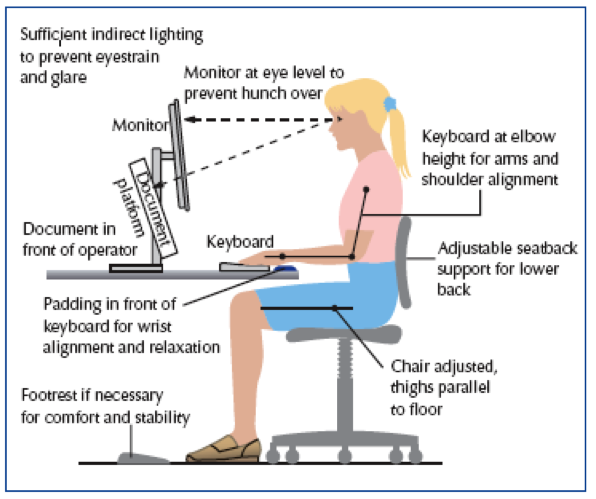 The solution is to use an external keyboard so that the keyboard can be at your waist position and the laptop screen eye level as shown in Figure 4. For working with tablets and smart phones you have little choice. You either look down or reach up to touch the screen. As much as possible tilt and raise the tablet so that you do not have slouch to see the screen. If you observe that you slouch and collapse while working, invest in an adjustable desk that you can raise or lower for your optimum height. An adjustable height desk such as the unDesk offers the opportunity to change work position from sitting to standing as shown in Figure 5. Figure 5. Example of a height adjustable desk (the unDesk) that can be used for sitting and standing. Although office chairs can give support, we often slouch in them. While at home we use any chair that is available—again encouraging slouching. Reduce the slouching by sitting on a seat insert such as a BackJoy® which tends to let you sit more erect and in a more powerful and energizing position see Figure 6. Finally, whether or not you can change your environment, take many, many short movement breaks– wiggle, stretch, get up and walk–to interrupt the muscle tension and allow yourself to regenerate. To remind yourself to take breaks while being captured by your work, install a reminder program on your computer such as Stretchbreak that pops up on the screen and guides you through short stretches to regenerate. Asundi, K., Odell, D., Luce, A., & Dennerlein, J. T. (2010). Notebook computer use on a desk, lap and lap support: Effects on posture, performance and comfort. Ergonomics, 53(1), 74-82. Peper, E., & Lin, I. M. (2012). Increase or decrease depression-How body postures influence your energy level. Biofeedback, 40 (3), 126-130. Peper, E., Booiman, A., Lin, I-M., & Shaffer, F. Making the Unaware Aware-Surface Electromyography to Unmask Tension and Teach Awareness. Biofeedback, 2(1), 16-23. Schwanbeck, R., Peper, E., Booiman, A., Harvey, R., and Lin, I-M. Posture changes with a seat insert: Changes in strength and implications for breathing and HRV. Poster submitted for the 46th Annual Meeting of the Association for Applied Psychophysiology and Biofeedback. Straker, L. M., Coleman, J., Skoss, R., Maslen, B. A., Burgess-Limerick, R., & Pollock, C. M. (2008). A comparison of posture and muscle activity during tablet computer, desktop computer and paper use by young children. Ergonomics, 51(4), 540-555. * Adapted from: Peper, E. (in press). Become the unreasonable person: Adjust your world to fit you! Western Edition and Schwanbeck, R., Peper, E., Booiman, A., Harvey, R., and Lin, I-M. (in press). Posture changes with a seat insert: Changes in strength and implications for breathing and HRV. Hi Erik–Too bad chairs are such a menace! Soooo uncomfortable! I sit on the floor, on a cushion, cross legged. Like I am meditating. I have a low “coffee table” for a desk. Works great! HI Erik – I learned from you to always turn my chair to face towards the lecturer if they are standing off to the side. I thoroughly enjoyed your seminar that day. I am now a psychotherapist and start my patients off learning about their posture from the inside. Thanks for your valuable leadership over the years. Oh, especially your outstanding book, Fighting Cancer!